But the question remains...can you afford it? 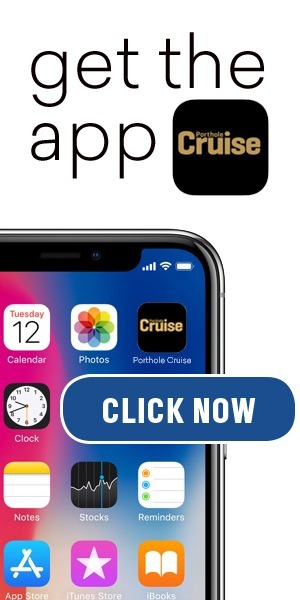 Following curiosity as opposed to guidebook spiels, I embrace the deep rooted impulse to get ahead of the crowd and visit stimulating destinations. 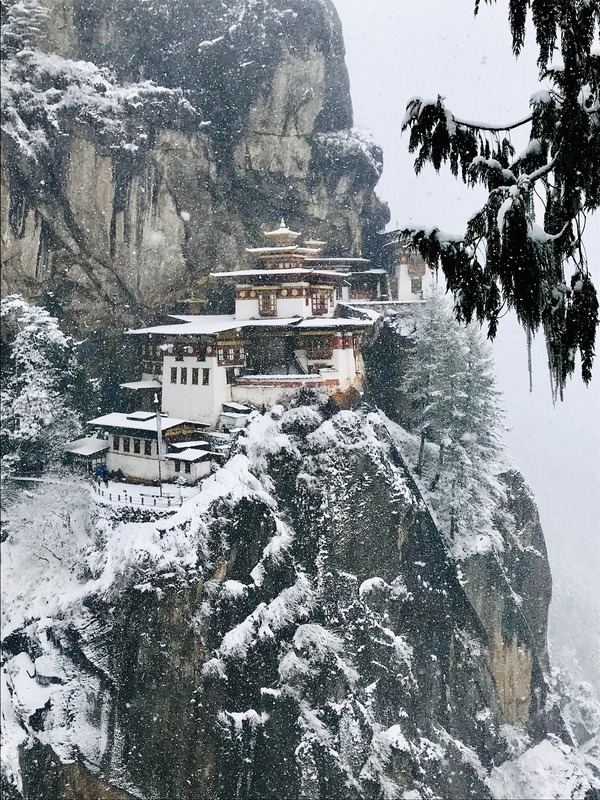 Venturing to the far flung corners of the earth is one thing, but a visit to the remote Kingdom of Bhutan provides a litany of serendipitous experiences. This small haven of natural serenity and humble aspirations will never be a cruise port of call due its landlocked status and lack of navigable rivers, but is an excellent pre or post cruise diversion. The nearby ports of Bangkok and Kolkata serve as gateway cities for flights with easy connections from Singapore and Shanghai. Flanked by the towering peaks of the Himalayas and bordered by Tibet and India, the Land Of The Thundering Dragon is emerging as an in vogue destination. Its centuries old sequestration from the outside world has recently been relaxed allowing intrepid visitors the opportunity to experience the pristine environment and a contagious focus on happiness. 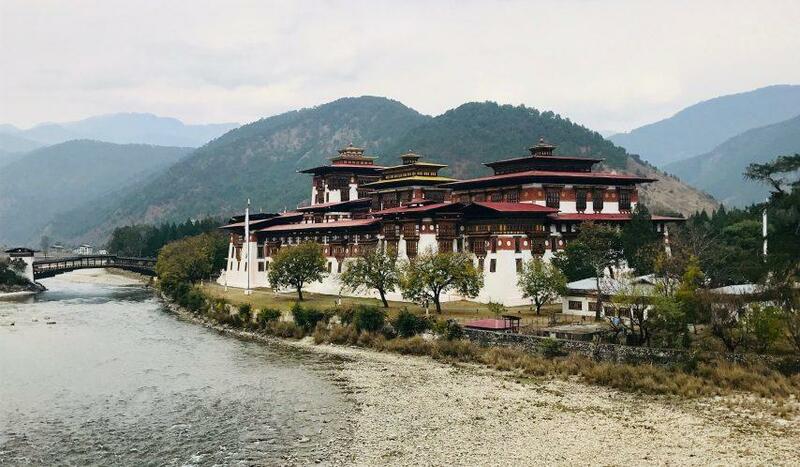 In fact, the official policy of Gross National Happiness or GNH, is not just a catchy marketing ploy but is an actual government initiative of the country’s benevolent King. The intriguing concept imposed in 1972 demands that sustainable development takes a holistic approach to progress, assigning equal importance to non-economic happiness. 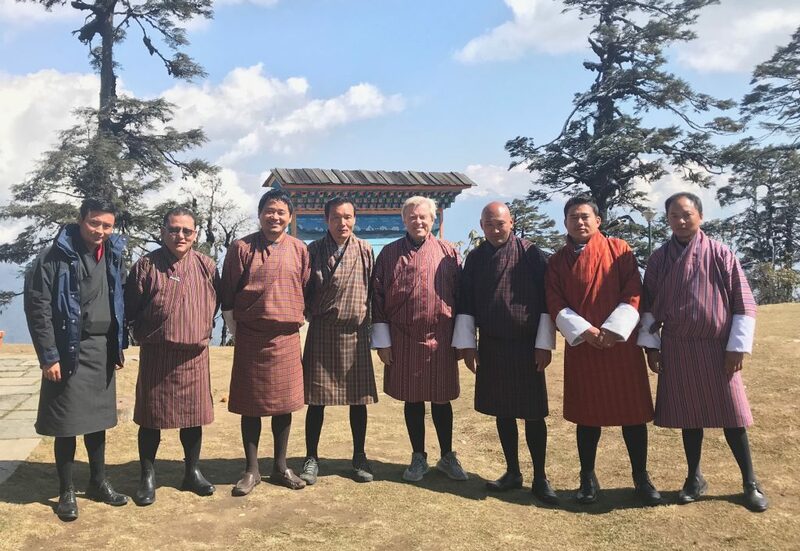 While other countries grapple for attention and aggressively pursue tourism, Bhutan takes a far gentler approach by imposing stringent entry requirements designed to protect its traditional culture. To qualify for an entry visa, visitors are required to arrange accommodations and licensed guide services in advance and must spend $200-$250 per person per day. The clear objective is to limit mass numbers and discourage the nomadic backpackers that have infiltrated so many other destinations. The only international airport is located in Paro, making it the natural first leg of structured itineraries. The initial emotion that grabs your attention at touchdown is the peaceful attitude, a clear adherence to Buddhist principals that prevails throughout your visit. For as much as we talk about mingling with locals, cultural immersion is best achieved by dressing in the traditional Gho, a robe like garment with black leggings for men and the Kira, a colorful full length skirt with dress jacket for ladies. The sight of school children dressed in these robes and dresses is profound cuteness. What more can be said about a country that has no traffic lights, introduced television for the first time in 1999, whose national sport is archery and a country where smoking is forbidden? Concern regarding international politics and global conflict is virtually nonexistent with hydro powered energy the number one contributor to the economy. 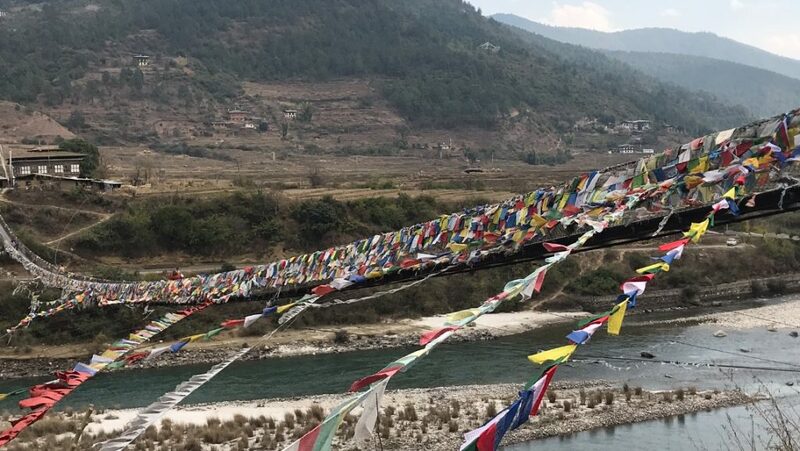 Travel by automobiles is limited to indispensable two lane roads and a 55 Km journey from Paro to Thimphu exposes the ubiquitous image of prayer flags on the roadsides, high mountain ridges and streaming from bridges. These colorful pendants are placed as specified prayers with the colored horizontal flags designed for individual requests and all white vertical flags placed in memorandum of deceased loved ones. Consulting with an astrologist for placement timing purportedly assures consecration and preferential results. Central to Thimphu’s visual image is the imposing Buddha statue overlooking the city from high atop the mountain. A significant segment of the government is administered here in the capital along with the Royal Residence. Contrary to the elaborate palaces of many countries, the Royal Family of Bhutan resides in an understated two story residence complex. There is a universal love of the family with mutually expressed respect from the Bhutanese people. Venturing out of the capital, all roads or perhaps more appropriately stated, the only road east points toward Dochula Pass. 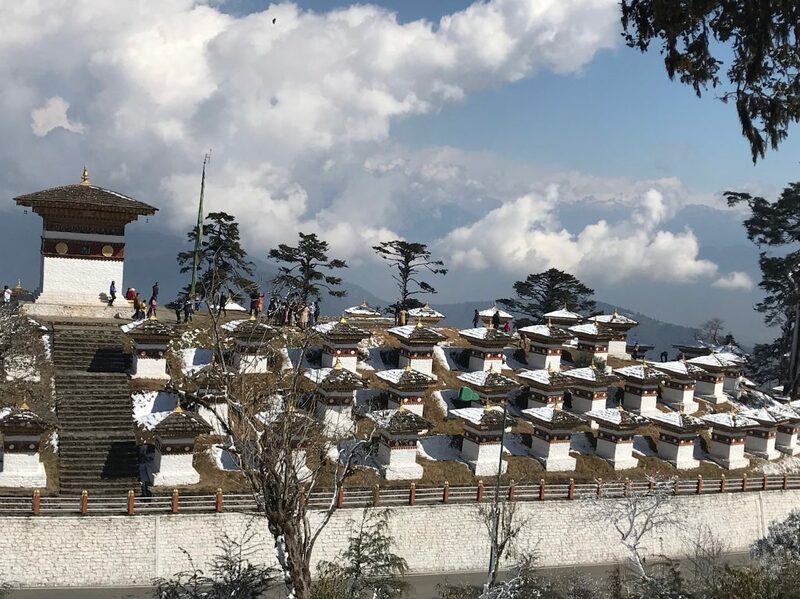 At an altitude of 10,170 feet, it is possible on a clear day to peer out to the snow capped peaks of the Himalayas, but the most visually inspiring photo-op is the sight of the 108 white chortens or stupas built as a memorial to a short lived battle by the Bhutanese Army over insurgent Assam rebels. The road eastward through a raw mountainous landscape leads to the fertile valley of Punakha. A twenty minute narrow trail hike through rice fields takes you to the Temple of the Divine Madman. Visitors can experience a dose of authentic Buddhism as dozens of devoted monks chant mantras that echo throughout the valley. The unblushingly displayed phallic figurines and paintings lend a degree of credibility to blessings of fertility. 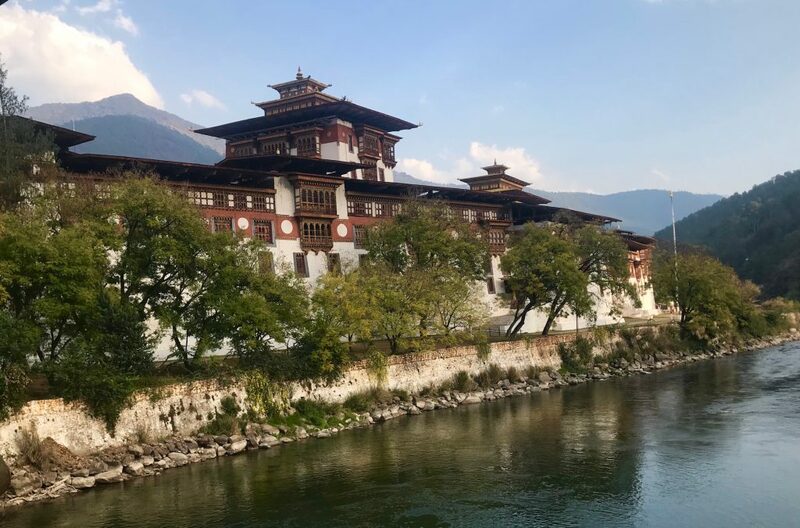 The most typical, yet amazing component of Bhutan’s appeal is the characteristic architecture of its homes, buildings and the massive Dzongs situated throughout the country, none more impressive than the Bhutanese. Initially constructed as a fortress at the confluence of two rivers, this massive complex is today shared as a Buddhist monastery and temple as well as home to a government administrative center. A massive courtyard displays intricate and colorful woodworking embellishments, while the elaborate central temple has played host over the years for Royal weddings and coronations. Back in Paro, no visit to Bhutan is complete without the adventurous hike to Tiger’s Nest Monastery. Perched on a cliff at an altitude of 10,000 feet, the only feasible way to reach the site is by a two and a half hour switchback hike. Horses are available to ease the effort but is emphatically discouraged. As explained by Kenzang, the tour guide, “Taking the burden off of yourself transposes the burden to the animal. How could that possibly bring good karma to an individual?” Perhaps the most iconic site in the country, an opportunity to look out from its lofty location summons up the inherent aura of spiritual introspect. Bhutan is nevertheless a land of bewildering paradox. The killing of animals, hunting and fishing is expressly forbidden, ironically requiring all meats to be imported from India. Climbing its gorgeous mountain peaks is strongly discouraged as this is where spirits dwell. Tourism ranks second in economic contribution, yet there is little urgency in pursuing its growth. There is something mystical about the country’s reverence to its Buddhist principles, a perplexing philosophy that begs examination. In spite of its spiritual tradition, a global, youthful identity is slowly creeping its way into Bhutanese culture. What will unravel out of this nibble into modernity has yet to manifest itself, but for now the politeness of its people, their colorful yet simplistic and spiritual life stand as highly regarded attributes of an emerging destination. Interested in the article on Bhutan, a country we have visited twice. We went for birding, but many others visit to absorb its unique culture and the beauty of this mountain kingdom. I would like to clarify one thing, while the per-day tariff is $200-250 (depending on time of year) this includes everything – accommodation, transport, food, as well as the required guide. Thus when compared to other all-inclusive tours, not that out of line. The charge is also the same whether you decide to stay in your hotel and play video games or trek for snow leopard. Also, after your first week you get a 10% discount. The Bhutanese want to encourage in-depth visits, especially those for focused on culture, nature or Buddhism. Also English is taught in all schools so most everyone speaks some, and many are as fluent as you or I.